This entry was posted in History, Religion, Society and tagged Bethlehem, Christmas, Jesus, Jupiter, Magi, star, star of Bethlehem, Three Kings, Wise Men. 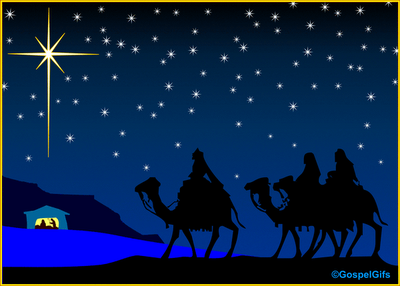 There is a theory that the star and the three kings are an astronomical phenomenon. Around the time of the winter solstice the three stars of Orion’s belt align with Sirius (the brightest star in the sky) to form a line which points at the horizon just where the sun rises on the Winter Solstice morning. This is the “birth” of the sun coming after it’s weakening; the days get longer, the sun stronger from here on in. Remembering that Christ is essentially the Sun King, this gives us a much older explanation for the Three Kings story. It could certainly have been an actual astronomical event. But it could not have been a star which led them and then stopped over the place where Jesus was. My point is, once you say “It wasn’t actually a star, or it didn’t actually do those things, they didn’t understand in those days”, then everything right through to the concept of God is open for revision in the light of scientific understanding. Alternatively you have to treat everything as a fairytale without historical truth. Apparently it was understood as a “particular event” taking place in a particular region – but since the gap between Jesus’ theoretical birth and the mysics showing up was a number considerably larger than a week (12 years? could have been). Thing also is, no one recorded what they were looking for, but having some experience with fortune telling suggests to me ‘there was a possible prophecy and he seemed to fit’. Astrologers are strange! I agree, Teunis. Prophecies are always safer for illustrating the past, than for predicting the future! Did you ever read Arthur C Clarke’s story ‘The Star”? If you haven’t do, you’d love it. It postulates that the star of Bethlehem was a supernova that took out a civilisation. And I’ve finally signed up for your blog because you talk about stuff that interest me. Thank you, Greta. Yes, I read all of Clarke’s short stories that I could find when I was in my teens. I recognise that astronomical events used to catch the eye and be remembered – in the nights before street lights! This post is really aimed at Biblical literalists – if the Bible says it was a star that led the way and then stopped over a particular house, was it therefore an actual star? Then we have the problem of a star’s mass. Or, if it wasn’t a star, but we can acknowledge that they called the perceived phenomenon of moving light (whatever it was) a star out of ignorance, then we have to allow everything in the Bible to be open to reinterpretation in the light of modern science, from the Garden of Eden to the very concept of “God”. Or, if it didn’t lead the Wise Men to a particular house and stop there (but was just, say, a supernova in the sky), then the whole story is false in its supernatural claims. The story only makes sense if it is allowed to stay a fairytale without any perspective, any context, any grounding in science and history. Read about the Star of Bethlehem. It explains it better and.thet.have tried to prove it with science.